Witches are individuals with special powers like ESP, telekinesis, mind control, etc. Robin, a 15-year-old craft user, arrives from Italy to Japan to work for an organization named STN Japan Division (STN-J) as a replacement for one of STN-J's witch hunters who was recently killed. Unlike other divisions of STN, STN-J tries to capture the witches alive in order to learn why and how they became witches in the first place. 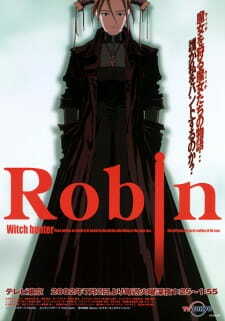 Witch Hunter Robin (WHR) is a dark, mysterious Anime centering around Robin Sena, a witch. Though technically, Robin is no witch, but actually a "craft" user. I won't go into details, but craft users hunt the witch users. Sound interesting? It is. The story behind this show really draws you forward throughout each episode. It's not a boss of the week show, and it's not a mindless action flick. You'll follow Robin as she finds out more and more secrets about the witch hunting organization she works for. The trials she goes through in order to achieve these hidden secrets are quite entertaining. The animation is nothing amazing, but far from mediocre. Most of the series is shot in a dark environment, so be prepared to possibly turn up your screen/video gamma or you might miss a thing or two. By far the biggest plus for WHR is its music score. Absolutely superb opening song "Shell". All the other background music throughout the show fits in wonderfully too. I could not have asked for a more perfect soundtrack. The relationship that grows between Robin and her work colleagues is well drawn out. Robin's motives and actions are appropriate for her personality, and we see her change throughout the show as different things are presented before her. Witch Hunter Robin is one of those shows that draws you in unconditionally. While some people might not appreciate or enjoy the genre or story, either after the fact or at first glance, I believe that anyone who loves intellectually grasping stories and characterization should at least try out the first few episodes of Witch Hunter Robin. While the story and plot is slow (sometimes tremendously), the overall plotline and conclusion to the anime makes you really see the epic and vast nature of just what was being approached with this series. Starting like any normal &quot;monster-of-the-week&quot; series, you are compelled into the daily investigations of the STNJ, a &quot;secretive&quot; detective agency (ala Men in Black) that hunts down abusive witches, individuals with various sorts of powers. Even some of these STNJ members are witches themselves, including the protagonist Robin. Robin is one of those characters that, in my opinion, stays with you long after you forget everything else about the series. As simple as she may seem on the outside, her personality and emotions unravel and become apparent later on in the series, and it does not disappoint. Robin is not the only highly characterized individual in the show, however. I found all of the other characters we met with just as comprehensive a background. The art and sound in this show are very, very good, sporting a soundtrack by the same person who did the music for Rurouni Kenshin. Overall, it was an unforgettable show for me that I both enjoyed and basked watching hours at a time. Those less familiar with the gothic/horror/scifi crossover genre might enjoy this series a lot more, at least 1 or 2 points more, than I did. If, on the other hand, you've seen a lot of this sort of stuff, this series will inevitably seem somewhat predictable. I'll not go into details to avoid spoilers, but let's just say that everything in the plot basically ended up doing what I thought it was doing. Masked soldiers, young girl with powers, weirdo green liquid, brooding hero-type, they were all unable to surprise me. Another annoyance was that I couldn't identify with any of the characters, which seemed emotionless, even frigid, to me. Lastly, the plot takes way to long to develop. Nothing of consequence happens in eps. 2-10. So what is good? Well, all of the above may just be a way for the director to allow you to focus on and enjoy the atmosphere of the show. Even though I never managed to "get into" it, I still noticed the obvious attention that was payed to the every scenery, location, costume and just the overall detail. This also means that every now and then something comes up that is not explained, simply because it's part of the scenery and not part of the plot. In all, this anime does a very good job of presenting an alternate reality that is fully believable, and aesthetically pleasing to look at. So, this is probably a very good series for those that enjoy atmosphere but don't usually like the action / magic / supernatural genres, because those elements tend to overwhelm a series' to the point of becoming rediculous. Well, here they don't.